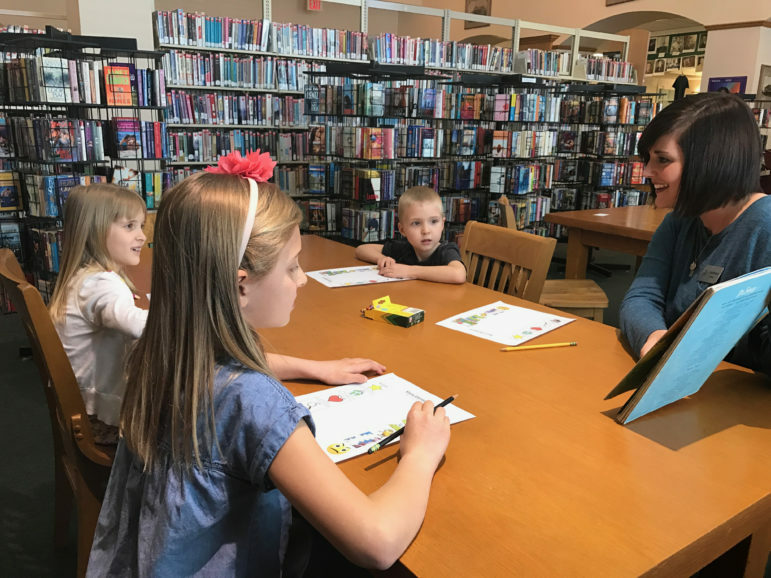 Epic teacher Katie Biswell reads Dr. Seuss to students Corinne Schulte, 7 (white shirt); Juliet Schulte, 8 (blue shirt); and Luke Schulte, 5 (black shirt); at the public library in Sapulpa Friday. Biswell earned nearly $40,000 working for Epic in 2015-16. Of that, nearly $16,000 was bonus pay and stipends. Biswell requests a smaller student roster to be able to work part-time. Although Epic is a virtual school, its teachers periodically meet students in person. Teachers at Epic Charter Schools are some of the highest paid in the state. They are also some of the lowest paid in the state. 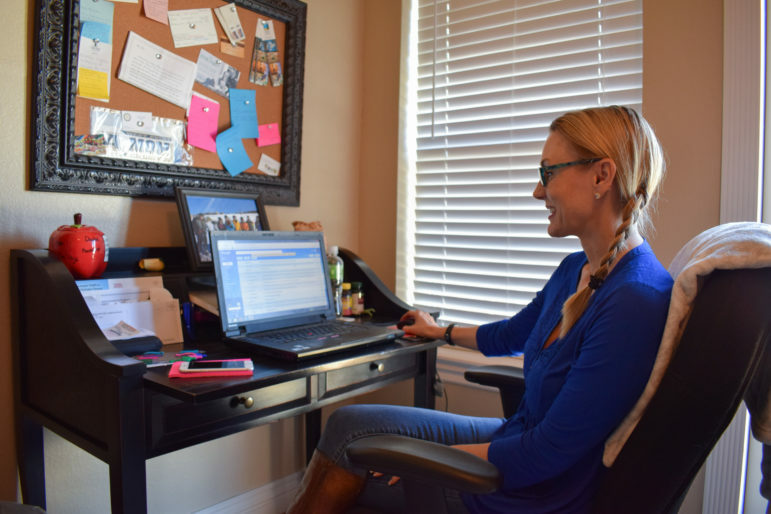 The wild swings in teacher compensation at the state’s largest online charter school are due to an unconventional program that allows teachers to earn a bonus of up to their base salary, which would double their pay. So a teacher earning $35,000, for instance, can earn an annual bonus of up to $35,000, pushing total pay to $70,000. Bonus pay allowed more than half of Epic’s 218 certified teachers to earn well above the average pay for public school teachers, according to Oklahoma Department of Education data for 2015-2016. But for some, the gamble didn’t pay off; they earned little or no bonus and their total compensation was less than the minimum salary required in traditional public schools. Meanwhile, Epic, which enrolled more than 9,000 students in pre-K through 12 this year and is now the state’s 14th largest school system, has average to low school grades and hasn’t seen significant improvement in student achievement. Epic has been using this model of performance pay — also known as merit pay —since it opened in 2011, an experiment in teacher compensation conducted using state per-pupil funds, which all charter schools receive. School administrators are proud of the program, which they say rewards educators who are willing to work harder and achieve higher student outcomes. “(Epic’s) pay performance model is one we feel like works, and is allowing us to attract some of the most talented teachers,” said Bart Banfield, assistant superintendent of instruction for Epic. So far, however, Epic’s use of hefty bonuses has not spread to other public schools looking to reward and recruit teachers. Merit pay, which rewards teachers for test scores and other student outcomes, is relatively rare in Oklahoma, education groups say. Nationally, it is also uncommon, with just 3.5 percent of schools offering it, according to a 2011 report from the now-defunct National Center on Performance Incentives. Charter schools are well-suited to experiment with merit pay because their teachers don’t typically belong to unions and the schools don’t have to follow the minimum salaries set by the Legislature. Online charter schools like Epic also don’t have the same facility and transportation costs that brick-and-mortar schools have. Some studies have found that performance-pay systems, especially those using standardized test scores, don’t improve student performance. Public school teachers in Oklahoma are among the lowest paid in the country, earning an average of $44,921, including benefits, according to the National Education Association. The minimum starting salary for teachers in Oklahoma with a bachelor’s degree is $31,600, including benefits. Educators here are clamoring for an across-the-board salary increase, and both the governor and Legislature have said it’s a priority this year. Epic, however, pays its full-time teachers an average of $61,200, which includes all compensation, from base pay and benefits to travel stipends and bonus pay. The school’s highest paid teacher made $92,890 in 2015-2016. At the other end of the pay scale, nearly 30 of Epic’s 132 full-time teachers earned below the state average in 2015-2016, state data shows. More than a half dozen earned below the state’s minimum salary. Teachers traditionally see their pay increase as they spend more years in the classroom or earn an advanced degree. Epic uses neither to determine a teacher’s salary. Epic teachers’ base pay is $1,000 per regular student and $1,500 per special education student. The bonuses are based on three components: standardized testing participation and performance, and whether students return to the school the next year, or retention. Performance bonuses are paid out three times a year. Epic teacher Kristi Rich works from her Maysville home Friday. Rich credits the school’s pay system for driving her to work hard and make sure her students excel on standardized tests. Teacher Kristi Rich, in her eighth year of teaching and sixth year with Epic, earned more than $83,000 in 2015-2016. She says she wouldn’t be able to earn that compensation in a traditional school, no matter how many hours she put in. Not all teachers are fond of the system. When asked, “What do you like best (about Epic)?”, teachers had many positives about the school but only one praised the bonus pay. Because it’s a charter school, Epic’s teachers are “at will” employees, meaning they can be fired at any time for any reason. Part of their contract states that if employees quit or are terminated before a bonus is paid out, they aren’t eligible to receive any portion of it. Administrators say the school has received 15 applications for every teacher vacancy posted this school year, which they say is evidence that the school’s performance-pay program attracts teachers. Epic isn’t the only school paying its teachers bonuses, but it stands alone in the magnitude of its program. Stroud Public Schools implemented a performance-pay plan four years ago. Teachers there are able to receive up to $1,000, depending on how many tested subjects they teach. The district also rewards all staff, from bus drivers to kindergarten teachers, when the seniors score well on the ACT exam, with a bonus of up to $300. 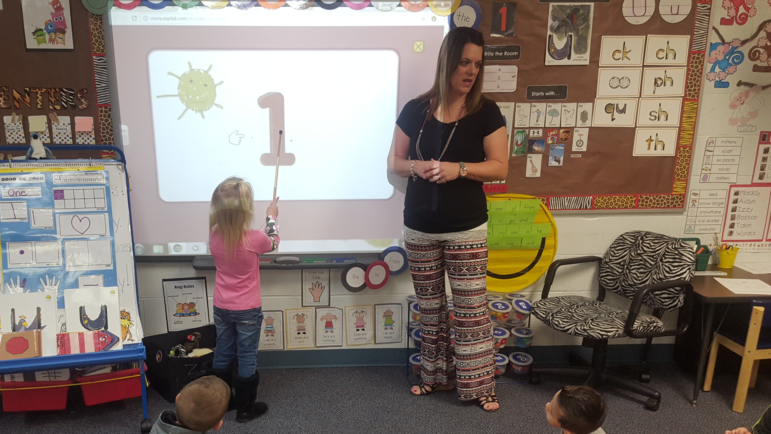 Amber Miller, a pre-K teacher at Parkview Elementary in Stroud, teaches her students a numbers lesson. All Stroud Public Schools employees can receive a bonus of up to $300 based on student ACT scores. Teachers can also receive up to $1,000 when students meet state testing benchmarks. Stroud Superintendent Joe VanTuyl is in the process of adjusting the bonus program and increasing the payouts to strengthen the school’s ability to recruit and retain high-quality teachers, but he says there is a financial limit to what makes sense. “We want it to be motivational, but we don’t want it to be the sole target,” he said. Performance pay cost the district $33,000 last year, VanTuyl said. In contrast, Epic spent at least $2.1 million on “other pay” for its certified teachers — pay above and beyond salary and benefits, including bonuses, travel and other stipends, such as for cell phones and internet use. School administrators say they are able to afford the program because they operate efficiently and allocate a larger percentage of their resources to teacher pay than a typical public school. Epic teachers carry higher student loads, for instance. And the school doesn’t provide transportation or food service. The most important question about merit pay is whether it works by improving the academic success of kids. Teachers are often opposed to pay that relies on student test performance because there are so many variables they have no control over, said Mary Sue Backus, a University of Oklahoma law professor. “It’s not always a fair measure of whether someone is a good teacher or not,” she said. A major reason for the success of a merit-pay program in Washington, D.C.’s 48,000-student public school district is consistent feedback provided by master educators, who observe teachers in their classrooms, said Jim Wyckoff, a University of Virginia professor who studied the program. “If you’re going to reward people for their behavior, you have to be rewarding them on outcomes over which they have control,” he said. Epic’s teachers meet with principals monthly, Banfield said, and are evaluated regularly using metrics the school has developed. Low-performing teachers are directed to online training videos to improve their craft, and first-year teachers are rarely terminated, giving them time to adjust to Epic’s model, he said. Epic’s teachers can improve student retention by engaging students and fostering deep relationships with students and families, Banfield said. “The majority of students we serve love their teachers and look at them almost as a family member,” he said. When asked for evidence that performance pay is improving student performance, Banfield cited Epic’s growth in enrollment and internal benchmarks on academic growth. On 2016 state report cards, Epic’s elementary and middle school earned a D+, pushed above the F threshold by a perfect attendance rate that has raised questions among state officials. A state lawmaker recently filed legislation to address the issue. Epic’s high school received a C, with low marks for student performance in math and science. Just 19 percent of students took a college entrance exam, such as the ACT, and only a quarter graduated — a rate slightly lower than in 2015. School officials have long railed against the state A-F report cards, saying they unfairly grade it for accepting enrollments all year and taking students who are close to dropping out. Epic instead points to students’ performance on end-of-year exams. In 2015-2016, 88 percent of Epic students were proficient in English II, better than the state average of 82 percent. In math, however, Epic students fared worse than the state average, with 61 percent proficient in Algebra I, versus 78 percent statewide. One factor in student success is teacher quality and retention. David Chaney, Epic’s superintendent, said the school has been significantly less impacted by the statewide teacher shortage than other districts of similar size, and pointed to its higher-than-average salaries as a draw. Administrators provided a teacher retention rate of 81 percent for the current year. However, that rate is slightly worse than the state average of 89 percent, as reported in a study by the Oklahoma Business and Education Coalition and the Oklahoma State School Boards Association. Epic parent Tara Cameron wasn’t aware her children’s teachers were eligible for bonuses based partially on how well her children score on standardized tests. But she has become frustrated with what she said is the school’s emphasis on practice tests instead of curriculum to introduce students to new concepts. “It’s been such a frustrating year because that (testing) is all they’ve cared about,” said Cameron, who has twin second-graders and an eighth grader in Epic this year. Cameron said she switched teachers twice this year and feels like she now has a teacher willing to work with her children.